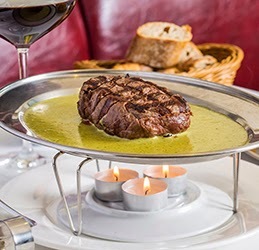 When I had to go to Hong Kong for business earlier this year, a friend of mine, Eddie, suggested that I dine at L'Entrecôte de Paris - the way he described it was so intriguing that I had to experience it for myself. My good friend Big Con was also passing through Hong Kong on his way back home from a conference, and being a steak aficionado as well, he was game to check it out with me. If we hadn't been specifically looking out for the restaurant, we would have walked straight past, because it's located on the third floor of a nondescript office-like building on Wyndham Street in Lan Kwai Fong (on Hong Kong Island), where the bright lights of streetside bars and restaurants (no doubt paying exorbitantly higher rents) beckon and jostle for your attention. There was an eclectic group of fellow diners in the restaurant, ranging from business-like groups, families and couples. This is a restaurant with just one dish on the menu, and that is of course its namesake (Entrecôte meaning a premium cut of steak). Ok I lied - there is one other thing on the menu, and it's the grilled salmon, but it's really there in deference to the non-red-meat-eaters who got dragged along to the restaurant by the person who chose to dine there. There is also a selection of sides and desserts as well, for the Mr Creosotes among us. The steak itself is a very simple concept - a prime cut of steak sliced into thick strips (the waiter will ask you how you want it done, but is there really any choice other than medium rare for good steak?) swimming in a deliciously rich special sauce (read secret recipe), brought to your table on a silver platter. It's served with all the french fries you can eat (at least it felt never ending to me). They don't actually leave the platter of steak at your table - because it's such a massive slab of beef, in true French bistro fashion, they've already made the decision that you cannot eat it all in one sitting and you must certainly do as you are told if you know what's good for you. So they dole out half the steak onto your plate together with a generous serve of french fries and drizzling of special sauce. The meat is sublimely tender and flavoursome - easily one of the best steaks I've eaten in my life (and I have spent a good part of it chasing amazing steaks), and the secret sauce truly kicks things up several notches. The wine is short and full of interesting wines unknown to someone from the Antipodes. We thought we'd spin the chocolate wheel and order a Chinese red wine - the Chateau Nine Peaks Reserva 2011 from Qingdao Greatriverhill Winery. It didn't say which grape varietal, but I'm pretty sure I tasted the trademark cassis of cabernet sauvignon. This was a deliciously fruity and voluptuous wine which matched up to the big flavours of the steak and rich sauce. It was also very reasonably priced! I can't remember exactly how much, but I think it was around the equivalent of AUD60-70 a bottle. A short while after we finish our first serving (naturally to give us time to start digesting the first portion that we both wolfed down), our waiter reappears to deliver the remainder of the steak, and yet more french fries. I ask for a third portion of french fries before my stomach realises how much food it is going to have to deal with and starts to protest. The meal isn't cheap at HKD268 per person, but it was certainly worth it. There was so much food that we couldn't fit in anything from the tempting dessert menu. Even Big Con, despite his size, claimed that he was stuffed and couldn't eat anything more. So there it is - L'Entrecôte de Paris in Hong Kong. If you love steak, you need to experience this (but make sure you have a light lunch). You also need to book a table in order to avoid risking disappointment - when we were there, the restaurant gradually filled up to capacity, and it looked like there were a few people who turned up without bookings and had to be turned away. P.S. because the lighting was dim, my battered old iPhone didn't manage to take any decent photos, so I've cheekily appropriated one from the restaurant's website (with appropriate copyright acknowledgement of course) to brighten up this post.